The SmartVac II Vacuum Base (size 13.5" x 20") is machined and ground flat and parallel to an accuracy of ±0.001". The Base easily connects to the SmartVac II Vacuum Power Unit (VPU) using a Connection Kit. It's even possible to link and operate multiple bases from one VPU. 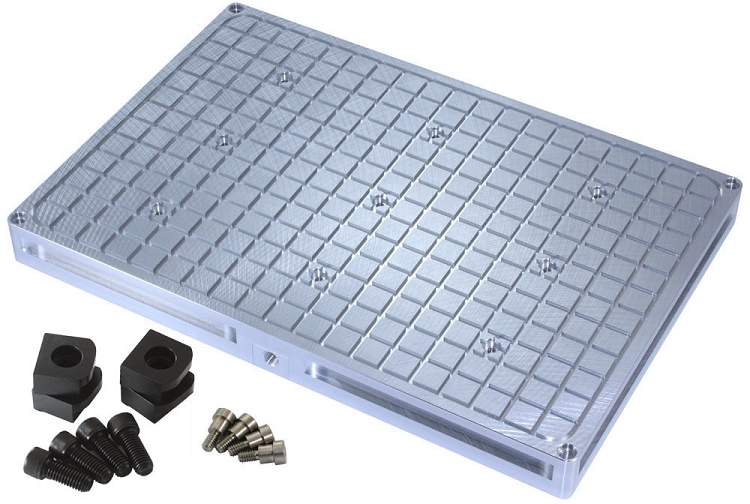 Plus, the Base is designed to accurately hold and position our Top Plates with a repeatability of 0.001". This opens up a world of custom fixturing to hold small or unique parts not readily held by a grid pattern. Base includes precision alignment bolts for Top Plates and toe clamps and bolts for attaching to T-slotted machine tables.